Help Required By Thurles Order of Malta Ambulance Corps. Mr Gerard Fogarty, (Deputy Officer in charge – Order of Malta Ambulance Corps Thurles), sends us the following reminder and request for assistance. “Our Annual “Easter Bag Packing” in Dunnes Stores, Thurles Shopping Centre, will take place this Thursday, April 18th: Friday, April 19th, 10:00am – 9:00pm and on Saturday, April 20th, 10:00am – 6:00pm. Anyone available to extend help for an hour or two, please do text us to 087 2390111. Holy Thursday :- 10:00am – 12:00 noon; 12:00 noon – 2:00pm; 2:00pm – 4:00pm; 4:00pm – 6:00pm; and 6:00pm – 9:00pm. Good Friday :- 10:00am – 12:00 noon; 12:00 noon – 2:00pm; 2:00pm – 4.00pm; 4:00pm – 6:00pm and 6:00pm – 9:00pm. Easter Saturday :- 10:00am – 12:00 noon; 12:00 noon – 2:00pm: 2:00pm – 4:00pm and 4:00pm – 6:00pm. Order of Malta Ambulance Corps Thurles are issuing an invitation to all of their former members to attend this year’s Anniversary Reunion Gala Dinner. Mr Gerard Fogarty, (Deputy Officer in charge – Thurles Unit) sends us the following report. Celebrating 70 years, and 50 years of the Cadet Corps in Thurles, we are cordially inviting members, past members and friends to join our Gala Dinner Dance Reunion on Saturday 13th October, 2018 in the Anner Hotel, Dublin Road, Thurles. Drinks Reception at 7.00 p.m., followed by a four-course meal and music by ‘Small Fish’ until late. Guest of Honour for the evening will be the National Director of the Ambulance Corps, Commander John Wright K.M. A special concession ‘Bed & Breakfast’ rate can be obtained from the Anner Hotel, by telephoning (0504) 21799. 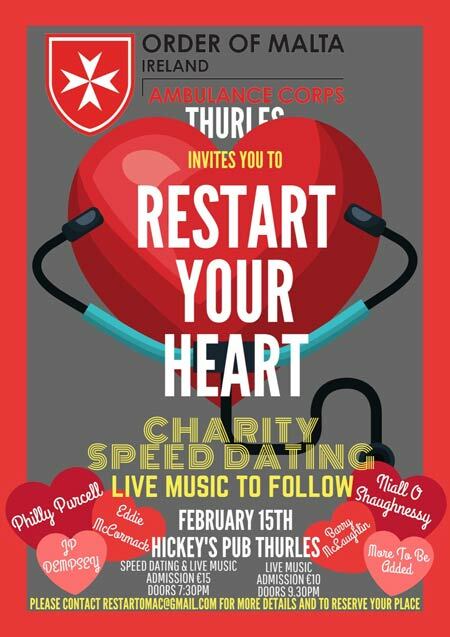 Tickets are also available by telephoning: 087 2390 111, or by E-mail: thurles@orderofmalta.ie, or from the Order of Malta Ambulance Corps, Training Centre, situated at Boheravoroon, Thurles, Wednesday’s at 8.00 p.m.
New Ambulance For Thurles Order of Malta. Order of Malta Ambulance Corps Thurles are proud to launch their new road ambulance this month. The Ford Transit, kindly donated by the National Ambulance Service, will replace the ageing Mercedes Sprinter, which has given the unit in Thurles many years of great service. As with their other road ambulances, it is fitted with all of the state-of-the-art pre-hospital emergency care equipment and medications required by their personnel (Emergency Medical Technicians and Emergency First Responders) providing the primarily care to cater for all major emergencies. The equipment provided includes:- automated external defibrillator, electrocardiogram heart monitor, terrestrial digital radio, wheelchair/stretcher lift, adjustable stretcher, emergency extrication equipment etc. The Unit’s fleet of three road ambulances, minibus and off-road ambulance are well-known around Thurles through their involvement in busy work schedules; providing emergency medical support at national and local events including Semple stadium and Thurles Racecourse, while providing transport to sick and special needs passengers, thus ensuring visits to hospital, while also supporting necessary social visits. Thurles Order of Malta Ambulance Corps Members would like to thank the generous parishioners of Holycross, Ballycahill, and Thurles for their kind support of Annual Church Gate Collections Appeal over the last two weekends. All funds collected directly contribute to the ongoing maintenance costs of the strong volunteer-operated ambulance fleet. Order of Malta Ireland Ambulance Corps Thurles. The Order of Malta Ambulance Corps, situated at Boheravoroon, Thurles, Co. Tipperary, will be holding their Annual Table Quiz in aid of their Lourdes Fund on tomorrow night Friday 23rd March in Hayes Hotel, by kind permission of the Hotel’s Management. The event starts sharp at 9.00pm and your generous support of this necessary fund-raiser would be greatly appreciated. Do keep in mind that every year members of the Order of Malta, from right around the globe, support ill patients during their Annual Lourdes Pilgrimage, and all funds raised from tomorrow nights event will go towards the cost of this years Thurles pilgrimage.